Portland Thorns FC topped the Washington Spirit 1-0 on the road on Saturday night in front of a crowd of 3,284 at Maureen Hendricks Field Maryland SoccerPlex in Boyds, Maryland. The win snapped a five-game winless streak for the Thorns and moved them into fourth place in the NWSL with a 3-3-3 (12 pts) record. The Spirit fell to 1-5-2 (5 pts) and sit in eighth place. Ellie Carpenter scored the first goal of her NWSL career for the Thorns in the 68th minute. With the goal, she became the youngest player to score a goal in NWSL history, at 18 years and 22 days. The goal came on an assist from Ana-Maria Crnogorčević, who tapped it to Carpenter after Tobin Heath passed the ball across the middle of the box. Portland thought they had earned a penalty kick in the 62nd minute when Midge Purce appeared to be taken down in the box by Spirit midfielder Andi Sullivan, but no foul was called. The Spirit had a few good chances of their own to get on the board. In the 20th minute, Mallory Pugh made a long run, dribbling through defenders, but Britt Eckerstrom was able to collect her shot. 20' @MalPugh turns on the jets! Ashley Hatch also had a header opportunity in the 10th minute, but couldn’t put it on frame. Strong build-up results in a shot attempt for @ash_hatch33! Eckerstrom made four saves in the game and the Thorns earned their first shutout of the season. The game was very even, according to Opta stats. The Spirit held a slight edge in possession 50.7% to 49.3% and shots 14-10. The Thorns held a slight edge in shots on target (5-4) and passing accuracy (75.5%-73.1%). The Thorns are next in action on Friday, May 25, at home vs. Utah Royals FC. The Spirit will host Sky Blue FC on Wednesday night. Match ends, Washington Spirit 0, Portland Thorns 1. Second Half ends, Washington Spirit 0, Portland Thorns 1. Attempt saved. Andi Sullivan (Washington Spirit) right footed shot from outside the box is saved in the bottom right corner. Assisted by Francisca Ordega. Attempt saved. Mallory Eubanks (Washington Spirit) right footed shot from outside the box is saved in the centre of the goal. Attempt saved. Andi Sullivan (Washington Spirit) right footed shot from the centre of the box is saved in the centre of the goal. Attempt blocked. Mallory Eubanks (Washington Spirit) left footed shot from the centre of the box is blocked. Assisted by Caprice Dydasco with a cross. Lindsey Horan (Portland Thorns) is shown the yellow card for a bad foul. Mallory Pugh (Washington Spirit) wins a free kick on the right wing. Substitution, Washington Spirit. Joanna Lohman replaces Estefanía Banini. Offside, Portland Thorns. Katherine Reynolds tries a through ball, but Tyler Lussi is caught offside. Attempt saved. Ellie Carpenter (Portland Thorns) right footed shot from outside the box is saved in the top left corner. Assisted by Christine Sinclair. Substitution, Washington Spirit. Mallory Eubanks replaces Meggie Dougherty Howard. Offside, Portland Thorns. Emily Menges tries a through ball, but Ana Maria Crnogorcevic is caught offside. Attempt saved. Tobin Heath (Portland Thorns) right footed shot from more than 40 yards on the right wing is saved in the centre of the goal. Assisted by Christine Sinclair. Substitution, Portland Thorns. Celeste Boureille replaces Andressinha. Tobin Heath (Portland Thorns) wins a free kick on the right wing. Goal! Washington Spirit 0, Portland Thorns 1. Ellie Carpenter (Portland Thorns) left footed shot from very close range to the top left corner. Assisted by Ana Maria Crnogorcevic. Substitution, Portland Thorns. Ellie Carpenter replaces Midge Purce. Attempt missed. Francisca Ordega (Washington Spirit) left footed shot from the centre of the box is close, but misses to the left. Assisted by Andi Sullivan. Corner, Portland Thorns. Conceded by Caprice Dydasco. Substitution, Washington Spirit. Francisca Ordega replaces Ashley Hatch. Attempt missed. Ashley Hatch (Washington Spirit) right footed shot from the right side of the box is close, but misses to the right. Assisted by Mallory Pugh following a fast break. Attempt saved. 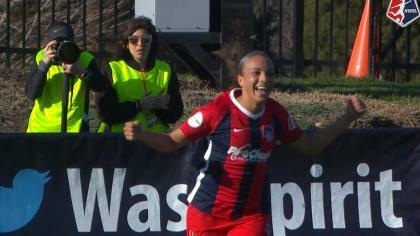 Estefanía Banini (Washington Spirit) right footed shot from outside the box is saved in the centre of the goal. Assisted by Mallory Pugh. Corner, Portland Thorns. Conceded by Whitney Church. Attempt blocked. Christine Sinclair (Portland Thorns) left footed shot from the centre of the box is blocked. Assisted by Lindsey Horan. Attempt missed. Lindsey Horan (Portland Thorns) left footed shot from outside the box misses to the right. Dangerous play by Tobin Heath (Portland Thorns). Second Half begins Washington Spirit 0, Portland Thorns 0. First Half ends, Washington Spirit 0, Portland Thorns 0. Attempt missed. Ashley Hatch (Washington Spirit) header from outside the box is close, but misses to the right. Assisted by Taylor Smith. Corner, Washington Spirit. Conceded by Emily Sonnett. Attempt blocked. 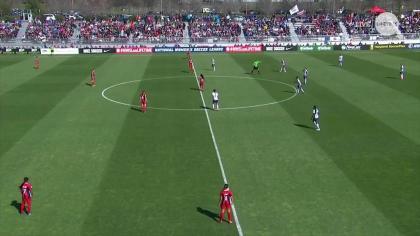 Estefanía Banini (Washington Spirit) right footed shot from outside the box is blocked. Assisted by Rebecca Quinn. Attempt missed. Mallory Pugh (Washington Spirit) right footed shot from outside the box is close, but misses to the right from a direct free kick. Corner, Washington Spirit. Conceded by Katherine Reynolds. Attempt saved. Ashley Hatch (Washington Spirit) right footed shot from the right side of the six yard box is saved in the centre of the goal. Assisted by Taylor Smith with a cross. Corner, Washington Spirit. Conceded by Emily Menges. Attempt missed. Ashley Hatch (Washington Spirit) header from outside the box is close, but misses to the left. Assisted by Andi Sullivan with a cross following a corner. Corner, Washington Spirit. Conceded by Meghan Klingenberg. Attempt missed. Tobin Heath (Portland Thorns) left footed shot from outside the box is high and wide to the left. Assisted by Ana Maria Crnogorcevic. Attempt saved. Tobin Heath (Portland Thorns) right footed shot from the centre of the box is saved in the bottom right corner. Assisted by Ana Maria Crnogorcevic. Attempt missed. Mallory Pugh (Washington Spirit) right footed shot from the centre of the box is close, but misses to the left. Assisted by Estefanía Banini. Attempt missed. Midge Purce (Portland Thorns) right footed shot from outside the box is too high. Attempt missed. Ashley Hatch (Washington Spirit) header from very close range is just a bit too high. Assisted by Caprice Dydasco with a cross. Attempt saved. Christine Sinclair (Portland Thorns) right footed shot from outside the box is saved in the bottom right corner. Attempt missed. Mallory Pugh (Washington Spirit) header from the centre of the box is too high. Assisted by Whitney Church with a cross following a corner.